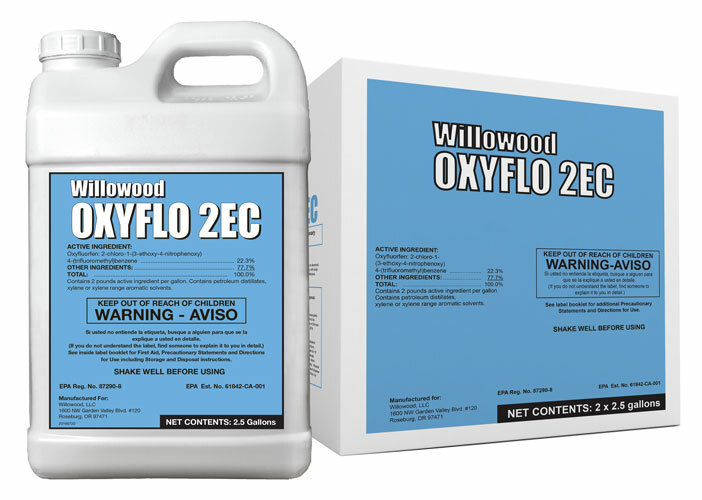 Oxyflo 2EC is a selective herbicides used for pre- and post-emergent control of broadleaf weeds. Oxyflo 2EC can be used on a wide variety of crops including artichokes, cole crops, citrus, corn, cotton, garlic, mint, onions, tree fruit, nuts, grapes as well as on fallow beds. With excellent residual activity, Oxyflo 2EC provides long lasting control that varies based on soil conditions and rate selection. Contains 2 pounds active ingredient per gallon. Contains petroleum distillates, xylene or xylene range aromatic solvents. GOAL® is a registered trademark of FMC Corporation.